Treatises, case law, Google…. what do they have in common? When you need answers, none of these will get you started faster than walking down the hall to chat with an expert. Down the Hall with Practical Law will host a panel of law firm and in-house law department leaders as well as Practical Law’s editorial team that will feature plain English “What do I really need to know?” discussions and insights on trending legal topics. No legalese; just expertise. Meagan Crowley Hsu is the deputy editor of Thomson Reuters’ Practical Law, The Journal: Litigation and she talks about what readers can expect to see in the current issue. Practical Law Startup & Venture Capital Senior Legal Editor Joe Green discussing common legal mistakes made by startup companies. 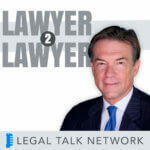 Privacy & Data Security Senior Legal Editor Mel Gates discusses cybersecurity and privacy issues. In the inaugural episode of Thomson Reuters Down the Hall with Practical Law, Kate Bally talks about the importance of establishing workplace policies.